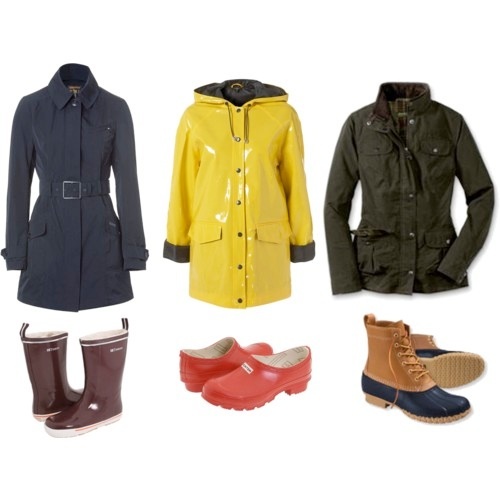 April in Columbus is living up to is rainy reputation, so I’ve been assessing my current rain gear situation and have decided that I “need” to have three different styles. One would be for evening or dressier situations. You know, for those times that you do not want to look like a polished adult. I thought that this navy trench from Woolwich paired with the maroon Tretorn wellies would work perfectly in those situations. This shiny yellow slicker from TopShop and my red Hunter clogs channels my inner 5th grader, while still looking pulled together. Perfect for running errands and walking the dog. My beloved waxed-canvas field coat from Eddie Bauer would look great with some classic LL Bean Duck Boots. They would be just the right combination for weekends and Springtime trips to the farmers markets and estate sales.